I am glad we are leaving the EU. It isn't a democracy. Sure it has voting rituals but it is not responsive to what people want and if people cannot organise and change things through the institutions of government then it's just a self-serving dead weight bureaucracy. Many on the centre left would argue with that. Plenty of NGOs won't see the problem. They see themselves as part of grassroots civil society, they have access to the levers of power and they get an audience. There are two basic reasons for this. NGOs have a sanitised reputation (regardless of how evil the consequences of their activities are), and secondly they are telling the EU what it wants to hear, lending legitimacy to its predetermined agenda. It's politically convenient to both. This is why the centre left does not want to leave the EU. It robs them of a cosy relationship with those in power and a lot o prestige in the process. It makes them accountable which is the one thing they do not want to be. Of course the public could organise and form trade associations and parties but simply getting elected into the European parliament does not achieve anything. In a proper parliament the party that wins the most seats has the power to set the agenda. Not so in the European parliament which is a subordinate to the other institutions. There is, therefore, no coherence. It does not represent anyone and serves only its integrationist agenda whether the people of Europe want it or not. In recent years we have seen right wing and "populist" parties gaining seats in the European Parliament but not influence. The EU sees this as a contaminant and takes measures to ringfence their influence and control their funding. They view it as an inconvenient blip to be contained until it blows over. The threat can be neutered and eventually continental populists get used to the high life and go native. The UK system isn't much better, but the referendum shows how smaller movements can threaten the incumbents and spur them into action. The Tories had to respond to the Ukip threat or be consumed by it. That is accountability and democracy in action. That, though, is only at election time. The rest of the time we watch helplessly as the nest of miscreants in Westminster indulge themselves in fads and virtue signalling - often with lethal consequences. That is why Brexit is not enough. As it happens the UK power system works in much the same way. Political campaigns outside of London tend not to exist without a sponsor inside the system and are only recognised if their agenda is convenient to the establishment. It has a way of appropriating grassroots campaigns and movements, hijacking them and exploiting them for their own ends. Brexit is one such example where the disaster capitalists have "taken back control" to the exclusion of all but the most useful idiots. What Brexit should be is a repatriation of vital powers for the people but instead we find that power being accumulated by the Brexit blob in Westminster for an agenda that would never win a parliamentary majority. I have of late taken to calling them Brexit luvvies - a circuit of the Brexit campaign aristocracy pushing their half-witted narratives, rewriting history as they go, claiming the Brexit mandate as a mandate for the most hostile and damaging Brexit imaginable. Like all other tribes within the bubble it requires conformity whereupon they will roll out the red carpet to anyone who conforms to the narrative and the naive who will lend them legitimacy or further prestige. This is why you can often find the idiots from Spiked Online and members of their respective knitting circles sitting on the same debating panels as the quarterwits from the IEA, TPA and whichever Tufton Street sock puppet has media attention. Being that they have fame within the bubble and are suitably sanitised they are afforded slots on Radio 4, Sky News and the likes, not least because they are free airtime filler - and being in London they are convenient. The debate, therefore, is dominated by a very narrow London clique reciting the same handful of mantras, who have no understanding of the games in play and no idea what is at stake. The devil here lies in the detail - but detail is not something our flappy mouthed London luvvies would ever apply themselves to hence the public debate is (deliberately) lamentably shallow and still at the Janet and John level where any concession to Brussels is a "betrayal of Brexit" and anyone who thinks a self-immolation version of Brexit is not a good idea is an anti-democrat seeking to "undermine democracy". The essential problem is that the likes of Spiked et al have an infantile understanding of Brexit. Brexit may very well repatriate certain powers but there seems to be the belief that Brexit also makes the EU vanish into the ether - as though having been a deeply integrated member of the EU for forty years presents no issues and that we need not concede anything in order to have a relationship with it. As much as the UK is safeguarding its own sovereignty the EU is doing likewise. It has a system for the control of goods within its market and as a sovereign entity it sets the terms and conditions of market entry. Should it make concessions to the UK it would be granting sole authority to the UK to relax its own controls thus weakening the overall integrity of the EU system. This it will not do so their view is that Britain as the smaller, weaker side in this negotiation should adopt and maintain EU rules if it wants free movement of goods. This is not unreasonable. In an ideal world we would like a less formal arrangement but the EU is a system of rules. Moreover it is understandable that the EU would be reluctant to revise its rules (even if it could) when we have the likes of Jacob Rees-Mogg publicly salivating at the thought of slashing regulation and unilaterally dropping tariffs. Why would the EU want that system vulnerability? So we have basically three options. 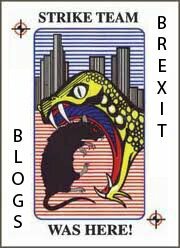 EEA, FTA or no deal. The option which satisfies the London luvvies is the one that sees all of our JIT production lines and manufacturing destroyed, a vast regime of customs red tape, a substantial loss of EU trade and massively diminished participation in European markets. The airheads of Spiked will say that none of the gloomy predictions have thus far come true thus we detail oriented people must again be exaggerating and scaremongering. Except that we are not talking about economic guesswork here. We are talking about the global rules based trading system where choosing not to abide by the rules means the loss of various rights and permissions which can only result in more overheads for business and substantially fewer options to sell into the European marketplace. We could go ahead and do this to ourselves, and that is what Spiked et al would have us do. Having done no research of their own, not really being the type of people to do that kind of thinking, they are up the creek without a paddle when asked to tell us why we should do this. Consequently to fill that void in their arguments they depend on the Brexit luvvies - all of whom subscribe to the demented foamings of Patrick Minford and the snake oil of Shanker Singham. The long term consequence of this is a Brexit so harmful, so painful and needlessly aggressive that the public mood sours very rapidly demanding that relations be restored whereupon we will have to go crawling cap in hand to Brussels and beg for whatever scraps they feel inclined to give us. There is only one way to avoid this. We could have opted for a partnership with the EU by retaining our EEA membership but this enrages the Brexit Taliban who won't rest until they can bring about the great Brexit firesale of UK assets. Being that Mrs May is at their mercy she can only really go through the motions of a negotiation as we drift toward the miserable consequences of her self-imposed red lines. 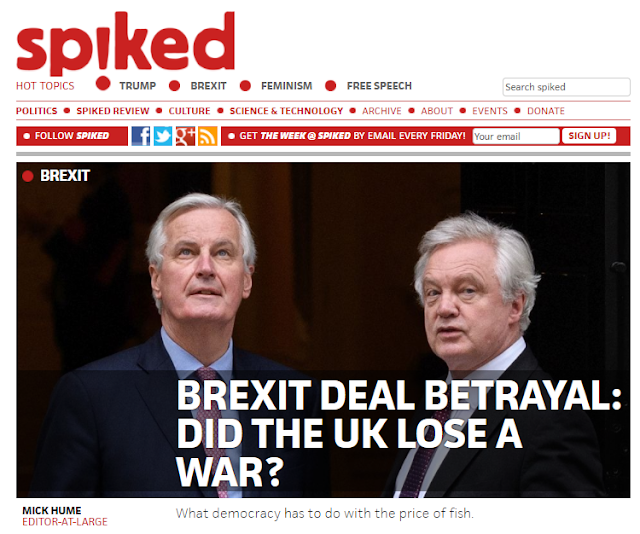 The Spiked morons will, of course, bitterly complain that the transition is a vassal state status but this really is the consequence of not thinking through the options and refusing to engage in the details. Having so successfully turned opinion against all of the viable options what we are left with is what we are left with. What follows will be a wafer thin FTA only marginally better than a no deal scenario, with substantially reduced aviation rights, a raft of new customs red tape, no free movement of goods, a wet border between us and Northern Ireland, long tailbacks at the ports and of those rules we do adopt to expedite the recovery, they will be adopted verbatim without any political or technical input. So much for sovereignty. What makes Brendan O'Neill's clan all the more contemptible is that they will complain about the consequences whatever happens, oblivious to their own role in bringing it about by lending legitimacy to the Brexit Taliban. For all that O'Neill regularly chastises the "chattering classes" when it comes to Brexit he is the epitome of it. The indolent class of hack who wafts into the debate without the first idea of what is happening or why, adding their considerable ignorance to the mountain that already exists while taking no responsibility for the inevitable consequences of their choices. From the beginning they have denounced those who take the time to study the options and issues as "technocrats" and "middle class" as though knowing what you're talking about is class betrayal. So well engineered is this narrative conformity that they whole sorry lot of them are unlikely to ever meet anyone who knows what they're talking about let alone listen to them. Consequently the London bubble suffers from a epic case of Dunning Kruger Syndrome as it bleats its betrayal narrative. This is ultimately another example of the intellectual poverty of the eurosceptic movement. Rather than Brexit being a means to an end it has become an end in its own right with no thought as to what we actually want to achieve with that reclaimed power - failing to recognise that EU membership is a symptom of the dysfunction in our politics. We should, therefore, not be surprised to see a bunch with revolutionary pretensions cosying up to the the disaster capitalists of the hard right who have no intention of returning any power to the public. The long term consequence of this is that very little will be resolved politically, with Westminster returning to its usual habits, on a leash to Brussels and no better off for it. This is exactly what The Leave Alliance was warning about which is why we have always seen the likes of the TPA, IEA etc as part of the problem. Politically the UK is trained to be subservient to London, actively seeking the attention of politicians and the media rather than building movements and going around them. This is why I have some considerable respect for Momentum. I don't like their politics but the way in which they have ruthlessly exploited the institutional weaknesses of the Labour party instead of toadying up to the incumbent powers within it is admirable. If only eurosceptics had sought to do likewise. Instead we have simply handed the power to the Tory right and the Westminster politico-media circle-jerk. For all the talk of bringing down the establishment all Brexit will really achieve is to change the management of the establishment where democracy will be as inert as ever it was. The insistence that every issue is binary and that any pragmatic compromise is a betrayal is ultimately teenage petulance - which runs deep on the leave side. That has been the most useful propaganda weapon for the Tory right. The fact is that we have a right wing coup in process, seeking to exploit Brexit for their own purposes. These people have been lurking in the undergrowth waiting for an opportunity to strike. We were always going to have to fight them and Brexit merely defines the battlefield but, depressingly, all our allies seem to have gone native - blissfully unaware of how they are exploited. Because of that we shall soon be back to square one. If anyone is betraying Brexit it's the useful idiots who horizons extend no further than Westminster. Things which are not surprising.